I am reviewing this superb book for CARR as it is probably fair to say that most people with an interest in the radical right also have some interest in the history of the Holocaust. More importantly, this is a book that deserves to be read beyond specialists in Holocaust historiography and general readers seeking a clear and judicious overview of that vast body of scholarship – which the book certainly provides. It is a book which, in explicitly seeking to explain key issues of the Holocaust, addresses potentially dangerous fracture-lines in modern societies and cultures in general. Most books are on the Holocaust are either general histories, histories of specific aspects of the Holocaust (ghettos, for example, or individual Nazi organisations), or they are sweeping guides to the historiography and the problems of memorialisation as well as other ‘aftermath’ issues (such as restitution, museums, or trials) that have characterised the post-Holocaust period. Very few historians have the courage to tackle the simple question in Hayes’ title. Raul Hilberg, whose book The Destruction of the European Jews (1961) set the tone for so much of the later historiography, said that he was afraid of asking the big questions for fear of providing small answers. If Hayes shares this fear he hides it well, but not through immodesty or grandstanding. This is a thought-provoking book in the best sense. Hayes’ command of the huge scholarly literature is remarkable, and he cuts swathes through it with clear and balanced assessments, made on the basis of many years of research. Hayes is above all an economic historian, best known for his studies of I.G. Farben (Industry and Ideology: I.G. Farben in the Nazi Era, 1987) and Degussa (From Cooperation to Complicity: Degussa in the Third Reich, 2004). This makes him sensitive to the use of statistics and social forces but by no means suggests that he is insensitive to the role played by ideologues or ideologies. The book is divided into eight chapters, each of which addresses one or more central problems of Holocaust history: why the Jews? ; why the Germans? ; why murder? ; why ‘so swift and sweeping’? ; why so little resistance? ; why did survival rates differ? ; why such limited help from outside? ; and finally, what lessons can be drawn from the above? Each chapter is a masterclass in historical analysis, and along the way Hayes not only provides succinct answers to the questions he poses (questions of long standing and which have filled many shelves’ worth of books) but unpicks many misunderstandings. For example, with respect to Nazi ideology, Hayes is clear that at the heart of Nazism lay ‘an unwavering dream of a Jew-free environment’, what Alon Confino has called ‘a world without Jews’ (65). Yet he is equally clear that antisemitism alone cannot explain the Holocaust: ‘the centrality of the so-called Jewish problem was much more important and obvious to Hitler than to the average German voter’. ‘Hitler was a product of crisis and opportunity’, he continues, ‘and Germans seem to have been drawn to him out of desperation and a sense that only the Nazis were energetic and organised enough to deal with the nation’s woes’ (65). Simplistic arguments that all Germans were antisemites who wanted to murder the Jews get short shrift here, as Hayes portrays an increasingly confident and radical Nazi Party which, in the context of a brutal ‘war of annihilation’ against Soviet Russia, and with the technical means at its disposal, rapidly shifted from a policy of deporting Jews beyond the borders of the Reich to – in expectation of acquiring a vast European empire – killing them within it. The Jews had almost no control over their collective fate. Individuals could flee to the forests in some cases and try to survive, but whole communities could not. Neither could they devise a strategy that could accomplish anything more than to delay their deaths. It is unfair and inaccurate to hold the Jewish victims responsible for what happened to them. Whether they lived or died depended on two things alone: the actions of the Nazi regime and the progress of the Allied armies (195). Another example concerns the attitudes of the Allied and neutral countries, the so-called ‘bystanders’. 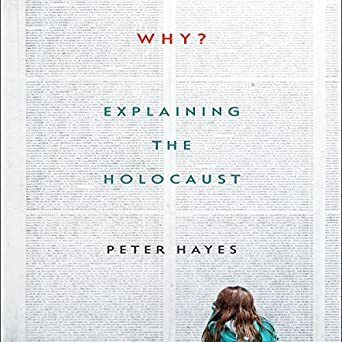 Hayes deals first of all with what he calls ‘prewar evasions’, observing that a combination of antisemitism as well as political and economic interests conspired to narrow the possibility of Jewish emigration from the Third Reich. He tackles restrictive immigration policy in the US and UK, including the limited possibilities for entering Palestine; the influence of antisemitic movements such as Father Coughlin’s in the US; and the role played by the Vatican, which was fearful of speaking out lest it lose its own room for manoeuvre, that is, to continue operating as a functioning church. During the war years, moreover, Hayes notes the negative correlation between information about the killings and action to stop them: whether out of concern to avoid Arab discontent in Palestine or an unwillingness to reveal that the Nazis’ secret codes had been broken, or the Vatican’s fear of communism in the wake of Nazi defeat. In consequence, very little was done to help the Jews. The creation of the War Refugee Board in January 1944 – primarily funded by Jewish charitable organisations – made little palpable difference to the Jews’ fate, and it even failed to persuade the War Department to bomb Auschwitz. ‘The tragedy of 1939-45’, Hayes succinctly concludes, ‘is that the fate of the Jews of Europe was always a matter of secondary importance to everyone but themselves and the regime that wished to kill them’ (296). Hayes’ conclusions bear serious consideration. Indeed, Hayes boldly end the book by offering five ‘lessons’. These are: 1) be alert but not afraid: bigotry will not disappear but a pluralist, open society can be defended as long as people care to defend it; 2) be self-reliant but not isolationist: this is a message aimed at minority groups, cautioning that too much focus on memory and identity politics can be counterproductive, since minority groups need friends; 3) ‘the primacy of avoiding situational causes’: public policy needs to be made responsible, since it is crisis that breeds demagoguery. As Hayes notes, ‘more Germans became antisemites because they became Nazis than vice versa’ (340); 4) the need for individual courage and imagination: this perhaps sounds trite but, as Hayes notes, it is never an easy path to choose; 5) the need to distinguish between means and ends: great harm can be justified by the ‘need’ to protect one’s family, homeland, faith, and so on, in times of extreme crisis, even to the point of making doing harm seem like a form of idealism. Hayes’ draws one general conclusion all of the above, a simple German proverb: Wehret den Anfängen, ‘beware the beginnings’. For students of the radical right, that is not just a watchword, it is a call to address the fact that many commentators detect a newly-confident fascism on the rise across the world. Professor Dan Stone is a specialist in the history and historiography of the Holocaust and of modern European history in general, with a focus on issues of fascism and memory. He is a Professor of Modern History at Royal Holloway, University of London and Director of the Holocaust Research Institute.